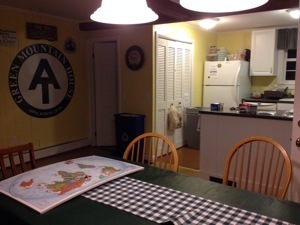 Green Mountain House Hostel, Manchester Center, Vt. AT NOBO mile 1,647.2, Monday June 2, 2014 — Plunk yourself down in a living room just like your own and turn the TV to the Red Sox game. What could be better than that? Well, for one you could be cooking up a juicy steak with a tossed salad in a sparkling fully equipped kitchen. Did I mention the Cherry Garcia ice cream in the fridge? About now you’d be thinking the hiker life is good, and so do I. If only the Sox were ahead of the Indians… Oh well, they ARE the Red Sox. Last night at Stratton Pond was fascinating. 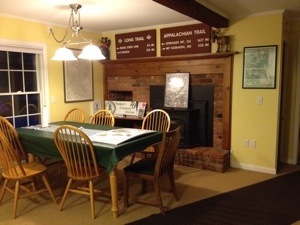 We shared the shelter with two middle age couples who were on their maiden camping trips. It’s safe to say it was a humorous night. Here are a couple of highlights. Nobody could believe we hiked the same distance in three hours that took them all day. One of the women refused to use the privy. It was too gross. Neither couple brought sleeping pads or air mattresses. Needless to say, sans insulation they suffered an uncomfortable and icy cold night in spite if their adequate sleeping bags. Little did they know, as we explained when everyone got up, that insulation underneath is more important than what’s up top. At least these folks were out there learning the same lessons we’ve all learned. I mean, who am I to talk. I’m the idiot who forwarded his sleeping bag ahead to Hanover, NH. Bo May know baseball. I know cold. 😦 The over night temps haven’t been above 40 F since I put that sucker in the mail. We reached town around noon and worked our way through the usual town chores after a trail magic ride from a local emergency room nurse who takes care of two shelters and some trail. Thanks Marge for all you do! Tomorrow in light of heavy rain in the forecast, Jeff, the owner of Green Mountain House, is going to slack pack us 18 miles forward. We’ll hike southbound back to town and spend the night here. It’s safer on the slippery rocks and in the mud to walk with lighter loads – snacks and first aid kits. 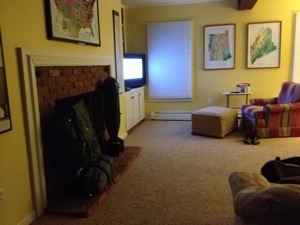 Ahhhh, the comforts of home. I guess being on the trail makes you really take stock of the important things in life — the things the rest of us continue to just take for granted. You really appreciate the small things, your friends and loved ones. That’s one of the positives of this experience. I won’t be taking much for granted in the future. Excellent and cushy digs for that ‘shelter’. You are leading the good life. 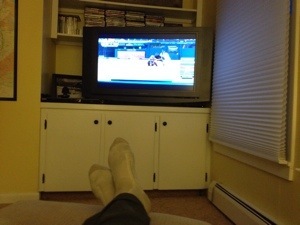 Between the comforts of home, watching the Red Sox and all the good food…are you guys really out hiking the trail ???? 🙂 Loved your battle account with the mosquitoes! Take no prisoners, show no mercy!! In 16 days I leave for Utah and be out hiking out with the big red rocks and be doing some canyoneering! Can’t wait! Tell Swade “Hi” . Hike on ! !